Last week I published an overview of Apple's profitability by quarter and the influences of gross margins, tax rates and operating expenses. In that post I stated while much attention is paid to the impact of gross margins, there are other cost components relative to Apple's financial performance that can have a greater influence on net results than the quarterly fluctuations in the gross margin ratios. In this post I will illustrate using graphs and corresponding table data the changing relative importance among Apple's reported cost components to the company's net results over the the past eight quarters. 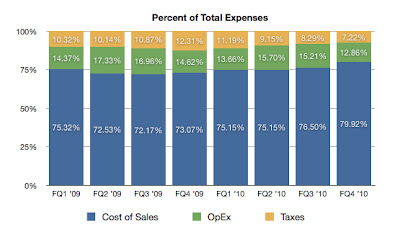 The graph below illustrates the reported expenses per revenue dollar for costs of sales, operating expenses and taxes. To present the data I converted the reported tax expense to a percentage of revenue and used the inverse ratio of gross margin which represents cost of sales. Using the fourth quarter of fiscal year 2010 (the September quarter) as an example, although cost of sales increased as a percentage of each revenue dollar (thus a reduced gross margin on product sold), total costs per revenue dollar actually decreased due to a declines in operating expenses and taxes relative to reported revenue. Although gross margins are an important measure of performance, changes in other major cost components relative to revenue can have an equal or greater impact than gross margins in determining a particular quarter's net income results. 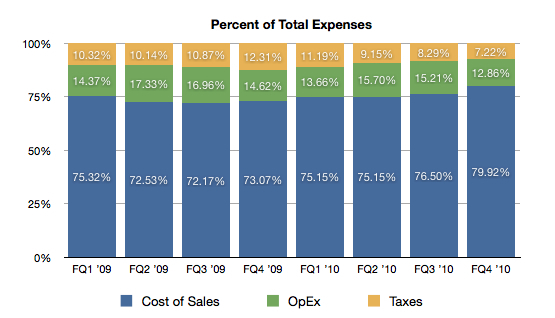 The graph below illustrates the relative contributions of costs of sales, operating expenses and tax expense to Apple's total reported cost over an 8-quarter period. As operating expenses and taxes are diminished relative to reported revenue, costs of sales will increase as a percentage of total costs and vice versa. 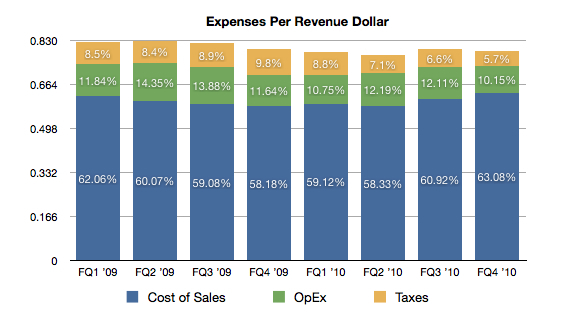 Using the fourth quarter of fiscal year 2009 (the quarter in which Apple reported its highest gross margin in the eight quarters compared (or lowest cost of sales relative to the revenue generated by products sold), the reported net revenue per revenue dollar was below that of the following quarter due to comparatively higher operating and tax expenses. Although Apple's cost of sales is the largest of the company's three major cost components, swings in the relative ratios of operating expenses and taxes to reported revenue can have greater influence on the company's quarterly results in any given fiscal period. While cost of sales (and the inverse ratio called gross margins) should be carefully watched, operating expenses and taxes also have a big influence on Apple's net earnings and earnings per share. A focus on gross margins only may lead to less accurate analysis of the company's quarterly performances and less accurate forecasts of future earnings results. Thank you to Sandy Leitao for her graph creation skills using Apple's Numbers software.